If in India the ruling BJP and the Hindutva brigade may have succeeded in inserting in their saffron agenda in textbooks, in far off California, they have suffered a major setback. 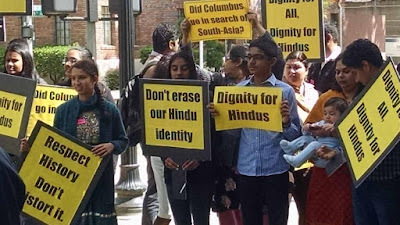 "The New York Times" reports, the American Hindu Foundation, known to be a protagonist of Prime Minister Narendra Modi, has failed to convince California's education officials that caste system is alien to Indian history and culture. Hindutva advocates, the daily reports, argued that the grades six and seven curriculum puts "too much emphasis on the caste system", adding, "It leaves Indian students vulnerable to bullying in schools. Dozens of students told committee members that they were taunted after learning about castes in school." "But activists for the Dalits, members of the 'untouchable' caste, said that glossing over the caste system would do little to protect students and would be an inaccurate portrayal of India", the daily points out. “Whether we like our history or not for any particular reason, we have to stick with the facts,” the daily quotes Risha Krishna, one of the Dalit protagonists in a discussion on what the curriculum should be like, as saying. Risha sharply criticises those who tried to project castes groups as having autonomous powers to decide how they would function, pointing out, this is just not true, and caste does not offer autonomy, but it is in fact a top down system. The daily reports, a discussion on the subject, in which about 200 individuals participated, touched on the manner in which "the culture of the region is portrayed, including women’s role in society and the vestiges of the caste system." Based on this discussion, California officials, had to "deal with a fight that mirrors similar arguments being made in India, where Hindu nationalist governments have begun overhauls of textbooks in some states." It adds, one side were advocates from the Hindu American Foundation, which seeks to shape the image of Hinduism in the United States. They wanted "the caste system to be explained as a phenomenon of the region, not as a Hindu practice — an idea that is not universally accepted in India." On the other hand, another group challenged the historical accuracy of this view. It said, the foundation was "trying to sanitize history by wiping out any link between Hinduism and castes." Quoting the Migration Policy Institute, a Washington-based think tank, the daily says, there are roughly 2.2 million immigrants from India live in the US. California, with its vibrant technology industry, has attracted a big chunk, with the the Hindu Foundation claiming, nearly half of them live in California.